My family has yet to taste this recipe but being the anchovy-loving, veggie-eating people that they are.....they will go BONKERS over it! Yes, I said "anchovy". I must be honest; I had never heard of Bagna Cauda until recently. A website, Food52, featured a salad version of this Mediterranean dip called "Bagna Cauda Salad". The colorful dish peeked my curiosity. Until that time, I had no idea how to make an anchovy tasty and I would not have touched this to my lips had I not seen it poured over a plate of beautiful veggies. Bagna Cauda is garlic, oil and anchovies cooked into a creamy dip then served with bread or vegetables. In the recent Food52 article, they put a spin on this by using it as a dressing...BRILLIANT! I came up with my own version of this healthy food and decided that Bagna Cauda not only works well as a dip or dressing but also as a sandwich spread. Couple with vegetables, this Mediterranean specialty seems the perfect tribute to spring. Served with asparagus, lettuce, and spring radishes, you won't be able to stop with one bite. As the rain comes down and the veggies spring up, try some Bagna Cauda and let me know what you think! This spread is cooked in much the same way as Dads Famous Onion and Mushroom Steak Topping. The ingredients are slowly cooked until they reach a creamy consistency. They cook well in a small LeCreuset pot which may be placed over a warmer for serving. 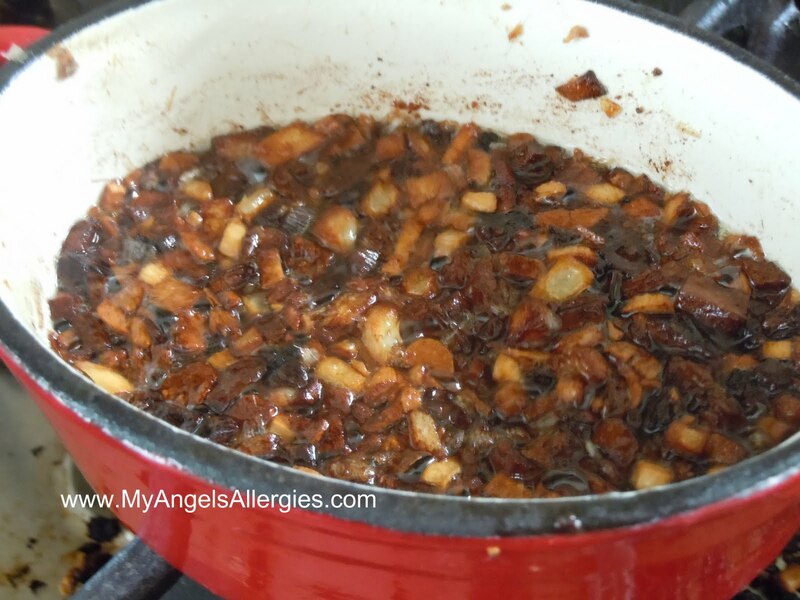 Place all of the ingredients in a shallow pot, preferably a small enameled cast iron. Heat ingredients on medium-low heat and allow to cook slowly for 20 minutes or until the ingredients have softened to a sweet taste. Watch carefully! 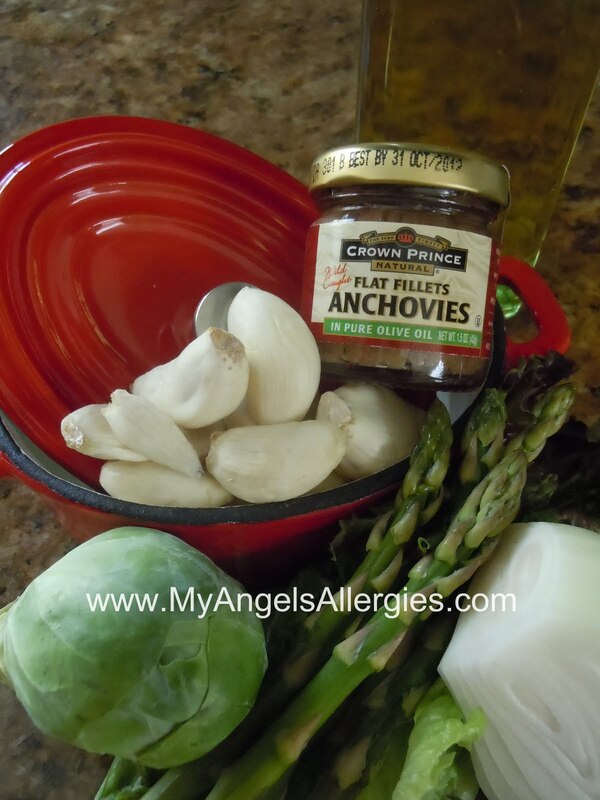 These ingredients will burn quickly and you will end up with blackened anchovy plus one very smelly house! Alternatively, if you are using an oven safe pot, you may place the pot in the oven to cook at 275 for 30 minutes or until the ingredients have softened to a sweet taste. Again, this can be tricky so watch carefully to avoid burning! Throughout the cooking process, use a fork to mash the anchovies and vegetables. If still too chunky after cooking, you may run it through a Magic Bullet or smash it with a mortar and pestle. Adjust seasoning by adding salt or oil. Serve warm over on a vegetable sandwich or as a dip with vegetables. It is also scrumptious when drizzled on salad veggies. Have fun with it! NOTE 1: When purchasing your anchovies, read the labels. There should only be anchovy, oil, and salt. Most of these are packaged internationally in fish factories but if you are concerned about cross-contamination, call the company. NOTE 2: I prefer enameled cast iron because most cast iron companies pre-season their non-enamel cookware in the factory with either soy, corn or vegetable oil. If you are sensitive to any of these oils or ingredients, you should be careful. See my review of Le Creuset enameled cast iron for more details. Boy that sounds good. I have to try making that soon. Thanks, AllergyMum. Let me know how it turns out!